Small pattern with a heart shape and floral motif,suitable for any cards and ornaments expressing our love for the loved ones around us. 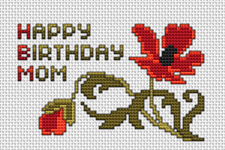 Beautiful birthday cross stitch card pattern with a poppy flower and the text:Happy Birthday Mom. Greetings card (in Bulgarian) for a native day. Let Our Lady watch over all who bear her name ! Miniature floral cross stitch card with the text Thank You.The pattern contains full stitches, 3/4 stitches and back stitches. 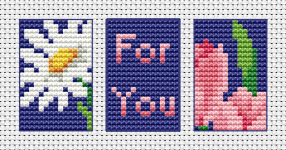 A triptych (divided into three sections) floral greetings card with the text:For You. Funny cross stitch pattern dedicated to the cool grandmas with the text:You can't scare me ... I've got grandkids! Cross stitched quote pattern with the text:You can't scare me ... I've got grandkids! Cross stitch pattern of a juicy pear and text based on the English proverb: "Plant pears for your heirs." 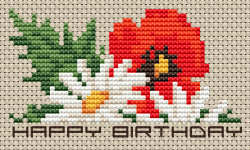 Birthday Flowers (daisy and poppy) cross stitch pattern with the text Happy Birthday. It's summer and time for traveling...A cross stitch pattern with the text:" Bon Voyage" to celebrate the summer,sea, sun and vacations. A monochrome floral pattern dedicated to the teachers with love and gratefulness! 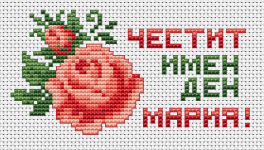 An easy cross stitch project, depicting a basket with flowers and the text: "Happy Birthday" in Bulgarian.